The following numbered items were all indexed separately under "urbanology" and appeared at the dates indicated on different pages in the original version of the Around Naples Encyclopedia. The shorter items have been consolidated here onto a single page in chronological order with links to longer items on other pages. A cabdriver complained to me the other day about all the construction sites in the city. "I can't get people where they're going, and they all think I'm trying to run up the fare on them by driving through the Panama canal just to get them home. There are 50 open construction sites in town!" The paper this morning more or less confirmed what he said as well as what I can see from my own window. Near my house, there is a street that has been torn up for five weeks and shows no signs of being ready for traffic in the near future. The paper today ran a map showing the locations of 35 sites that traffic simply has to avoid or try to go around somehow. They range from the complicated and eternal construction for the new Naples metropolitana—the subway—to simple ditches along the streets for fiber optic lines and assorted plumbing—all of which, however, close the road. "Eternal" brings to mind the great Italian expression, "La fabbrica di San Pietro!" used as a metaphor of things that take too long to build, referring to the great length of time it took to finish St. Peter's in Rome. You hear that figure of speech a lot these days. The Gulf of Naples really has two bays. In the east, the Bay of Naples, itself, includes—at the extreme end—Sorrento; then, the towns along the slopes of Vesuvius, the city of Naples, proper, and the areas known as Mergellina and Posillipo. Rounding Cape Posillipo, you come to the other bay: the Bay of Pozzuoli. It is very historic and includes the small isle of Nisida, the town of Bagnoli, the fabled Flegrean Fields, Pozzuoli (with Lake Averno, the entrance to Hell in The Divine Comedy) and Baia, the site of the Roman imperial port. The bay—and the Gulf of Naples—ends at Cape Miseno, directly across from the islands of Procida and Ischia. 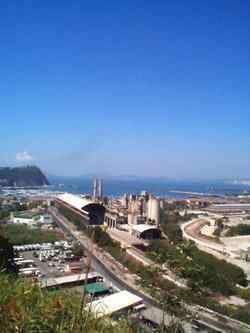 At the beginning of the 1900s, the eastern end of the Bay Pozzuoli—precisely, the town of Bagnoli and the area running out to Nisida—went through years of extended industrial development. A steel mill was built there as part of the mammoth development of the whole Neapolitan area, a project lasting decades and known as the Risanamento of Naples. The alternative plan—the one that was not chosen—involved a quite different approach, architect Lamont Young’s plan that would have turned Bagnoli into a pseudo-Victorian imitation of a British seaside resort. As a result of the extreme industrialization of Bagnoli, the area simply turned into an overbuilt blight of grime, noise, traffic and all those things that one would rather not associate with what is, by common observation, one of the most scenic bays in the Mediterranean. Things changed in the 1990s: they closed the steel mill and started a gradual conversion to a post-industrial local economy more based on tourism. The City of Science has been open since November 2001 and is the cornerstone, so to speak, of the whole plan. It fronts the sea with a beach and small port for recreational craft. Eventually, the rejuvenation of the area should "ripple" along the seaside past Bagnoli and Pozzuoli to Baia at the other end. It is an ambitious plan, and one hopes for the best. The urban renewal that swept Naples in the last decades of the nineteenth century went by the pleasant name of ‘Risanamento', meaning, literally, ‘making healthy again’. In the name of achieving this worthy aim, a large number of old, even ancient, structures were cleared away. In some cases, the results were quite pleasant; a case in point would be the magnificent Galleria Umberto finished in 1890. 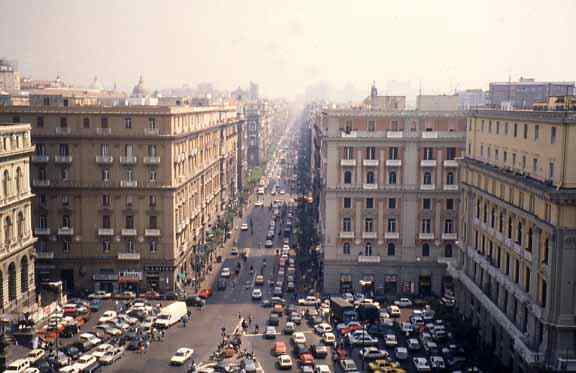 Some controversy, however, surrounded the massive clearing of a wide swath of buildings between what is now Piazza Giovanni Bovio (called, simply, Piazza della Borsa (the stock exchange by most Neapolitans) and the central train station, over a mile away, in order to build a broad and modern boulevard named Corso Umberto and called by most the rettifilo —the straight line. The project, for better or worse, went ahead. 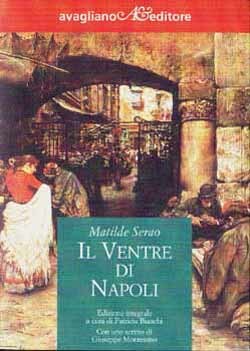 Matilde Serao used Depretis' infelicitous phrase in the title of her book, Il ventre di Napoli (The Bowels of Naples, book cover above). The book first appeared in serial form in nine installments in a newspaper in Rome, where Serao was living in 1884. In August and September of that year, Naples suffered its fifth and worst cholera epidemic in the 25 years since its incorporation into united Italy. The death toll was seven thousand, and Prime Minister Depretis was convinced that the overcrowded and filthy center of Naples simply had to be torn down, aired out, and cleaned up (with a modern sewage system, among other things). The first chapter of Serao's book is in the form of a letter to Depretis, taking him to task for not really understanding Naples and its problems. Did he really think that building a few new streets was going to fix the problems of a city where poverty is so endemic that an entire family lives in one room—where they are born, where they eat, sleep, and die in a single room? In 1904, 20 years after the project started, and at a time when much of the Risanamento had either been completed or was in various stages of completion, Serao damned it with faint praise—the new university building is nice, she said. 6. see Lamont Young and Utopian Naples.